.:. Hiking in Big Sur - Hazards .:. "Leaves of three, let them be" goes the old saying. The scourge of bare limbs and careless wanderers, poison oak is found just about everywhere in Big Sur. If you know what to look for, it's fairly easy to walk around, but sometimes a trail is so tight and the leaves so thick, you can't avoid getting a bit on your legs or arms. The photo above should give a good idea of what it looks like (this one shows little oil on the plant, whereas the leaves at the top of the page are nice and shiny). The leaves turn red and yellow, and can drop off in late fall, but I've seen green, oily poison oak leaves in the middle of December. The stems are smooth and can also get you, though not as bad as the leaves. My experience has been that you can get a rash from poison oak a few times, and not see much reaction, but then it can hit you hard. Try not to confuse poison oak with the harmless, but similar looking California blackberry plant (pictured above) which can also appear as leaves of three. The main difference is that the blackberry stems have little hair-like thorns and barbs all over them. They also are a lot less shiny and not oily looking (the ones above are wet) and tend to be more jagged around the edges. If you think your skin has been touched by either some poison oak leaves or sticks, the best thing to do is wash the exposed area with soap and cold water as soon as possible. If it gets on your clothes, keep an eye on what they touch (such as a car seat) and run them through the washer at least twice. Don't touch your face until you know your hands are clean! I've found that if a rash does develop, rinsing it with the hottest water you can stand helps reduce the itching and seems to make it go away faster. Hold the affected area under hot running water for a couple minutes until the intense itching stops. This should release all of the itch-causing histamines and you should be fine for about 6-8 hours. So far I've only come across one rattlesnake (that I know of) while hiking Big Sur, so I took a picture of it. Not a big one, but we stayed out of its way, since even the small ones will strike and are poisonous. Rattlers like to sun themselves on rocks and warm open areas like trails, so always beware. If you are climbing rocks, don't put your hand or foot anywhere you can't see clearly. Sometimes they like to hide in small dens, and their colorations can vary to blend in with their environment. 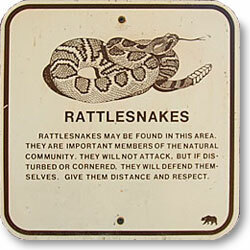 Rattlesnakes can be identified by the patterns on their back and the rattle at the end of their tail. 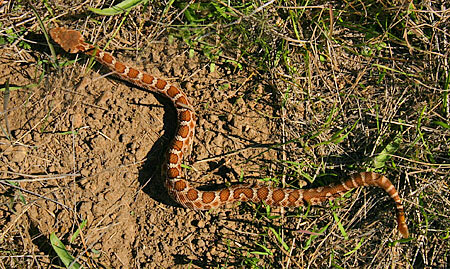 Sometimes the rattles can be small or missing, so don't rely on seeing or hearing one before approaching a snake. Some folks mistake gopher snakes for rattlesnakes, so if in doubt, back away quickly. The snake will try to get away from you if not cornered or threatened. If you get bitten, seek medical attention immediately! While around 8000 people in the US get snakebites each year, only about 15 are fatal. Keep the victim calm and the bitten part of the body below the heart to slow the spread of venom and find first aid ASAP. Ticks are small, insect-like creatures that are most often found in naturally vegetated areas. 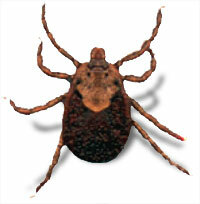 There are many different kinds of ticks in California, but only the western black-legged tick transmits Lyme disease. Ticks often hang on to the tips of tall grasses and other plants and then grab hold of your clothes or skin as you brush the vegetation. Try to keep to the center of trails and avoid walking through tall grass. Seems that no matter how careful we are when hiking, we'll still pick up a tick or two along certain hikes. Check your legs and shoes every hour or so. After the hike, check yourself thoroughly from head to toe. Wearing light clothing makes this easier. If you find a tick, you should remove it with tweezers by grasping it close to the skin and applying a steady upward pressure to make sure the entire tick is pulled free. Do not use insecticides, lighted matches or gasoline to remove ticks, as these techniques are ineffective. After the tick is removed, individuals should wash their hands and apply antiseptic to the affected area. Pets should be regularly checked for ticks. One of the pleasures of hiking is being able to observe natural ecosystems and wildlife in their native habitat. It is important to have respect for all animals living in the wilderness and to also be aware of a few safety tips. When hiking in mountain lion habitat, it is always best to hike with a companion. Encounters with lions and bears are very rare, but it is important to know what to do when and if you do see one. Mountain lions are also called cougars, and this is one hiking hazard that I've never seen in Big Sur, although I did spot one near our home just south of Big Sur. 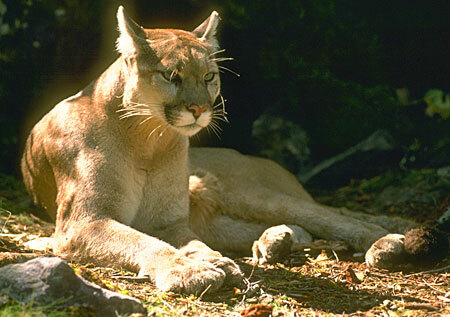 The news tends to sensationalize mountain lion incidents, so the public is generally overly fearful of an encounter. The fact is that there have been only 14 fatal attacks on the North American continent in the last hundred years, and you are over a thousand times more likely to be killed by lightning than by a mountain lion, but caution is still advised. Always be aware of your surrounding. It is best not to startle a lion. Lions are shy and elusive creatures and most lions want to avoid humans. If they hear you approach, that's generally enough to send then on their way. Make your presence known by talking, singing, whistling or wearing a bell. Don't approach a cougar. Most cougar want to avoid humans. Give a cougar the time and space to steer clear of you. Never run past or from a cougar. This may trigger their instinct to chase. Make eye contact. Stand your ground. Pick up small children without, if possible, turning away or bending over. Never turn your back and walk away; allow a forward route of escape for the lion. Keep direct eye contact and back away slowly. Never bend over or crouch down. Doing so causes humans to resemble four-legged prey animals. Crouching down or bending over also makes the neck and back of the head vulnerable. If you encounter a cougar, make yourself appear larger, more aggressive. Open your jacket, raise your arms, throw stones, branches, etc., without turning away. Wave raised arms slowly, and speak slowly, firmly, loudly to disrupt and discourage predatory behavior. A sports whistle can be helpful as a scare tactic. Try to remain standing to protect head and neck and, if attacked, fight back with whatever is at hand (without turning your back)people have utilized rocks, jackets, garden tools, tree branches, and even bare hands to turn away cougar. Again, if attacked, fight back. Black bears are relative newcomers to the Big Sur area, and while still rare, are spotted occasionally. They are believed to be colonizing the area as a result of being pushed out of southern California. Many of the same common sense rules apply to bears that apply to mountain lions. Always be aware of your surroundings. Look for physical signs of a bear and avoid surprising a bear by making your presence known by talking, singing, whistling or wearing a bell. Avoid hiking with odorous foods, we all know that bears are attracted to human food. Never feed a bear! If you spot a bear and it is not aware of your presence, detour quietly and quickly. If you have an encounter, remain calm and do not run; never approach a bear and allow it plenty of room to continue it's activities and a forward route of escape. Always face the animal and back away slowly. If they approach stand your ground, make noise and look as big as possible, waving your hands and opening your jacket over your head. Black bears are generally timid and shouting and clapping will usually stop their approach.